A few years ago if you told me I’d enjoy wearing jeans, I’d have thought you were mad. I went through a phase where I wouldn’t wear them at all for any reason, and this continued when I got into wearing vintage because I was all about skirts and stockings for all occasions. 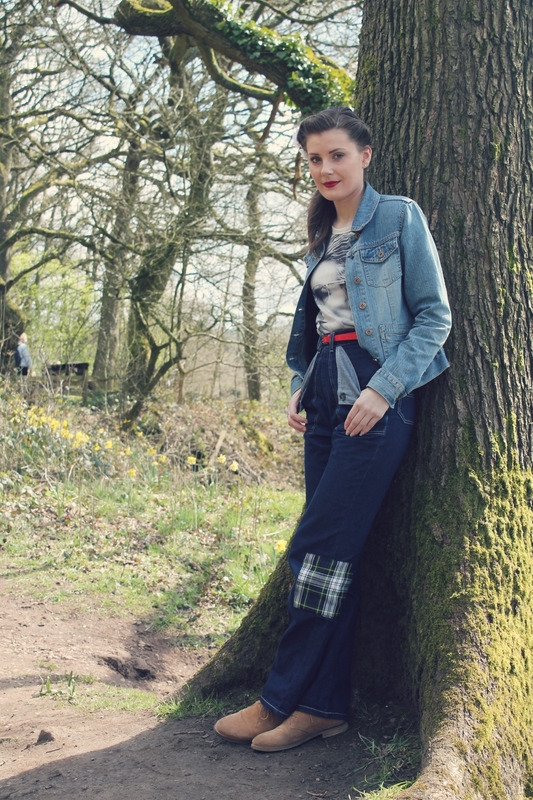 However, I’d seen other girls really rocking retro jeans and I eventually decided to invest in a pair of Freddies of Pinewood jeans which I enjoyed wearing so much that they were quite quickly followed by a second pair. If you’ve been a reader of Lovebirds Vintage for a while, you will no doubt have seen both pairs of Freddies appear on numerous occasions as I find them comfortable and stylish, and thanks to the vintage styling, they have none of the negative features I’ve come to associate with jeans (such as the muffin top so often caused by low-rise trousers). Unfortunately, I went to put on one pair of my Freddies a while ago and discovered that they had two small holes in one of the legs. I was disappointed because I have owned them for maybe a year and a half to two years, and I have only worn them as a fashion item so they haven’t been subjected to any undue wear and tear. They seem like a good quality denim with no stretch and they weren’t the cheapest of jeans to buy, especially on my budget. I’m really not sure where the holes came from, but I duly patched them up to make them last a bit longer. Sadly, the zip has also separated at the bottom. I have replaced zips in a couple of dresses but since I don’t think my sewing skills run to replacing the zip in jeans, I’ve MacGyvered a fix by putting in a stitch above the break to act as a new stopper (sorry if I’m not using the correct terms for things, I’m sure someone with more sewing knowledge can correct if necessary). Anyway, since one pair of my Freddies are now looking a little rough around the edges, I decided to purchase another pair of retro jeans as I now find them a very useful and practical wardrobe staple. Although I’ve loved my Freddies, I decided that in light of the holes and the broken zip, I’d give another brand a chance and see how they compare. 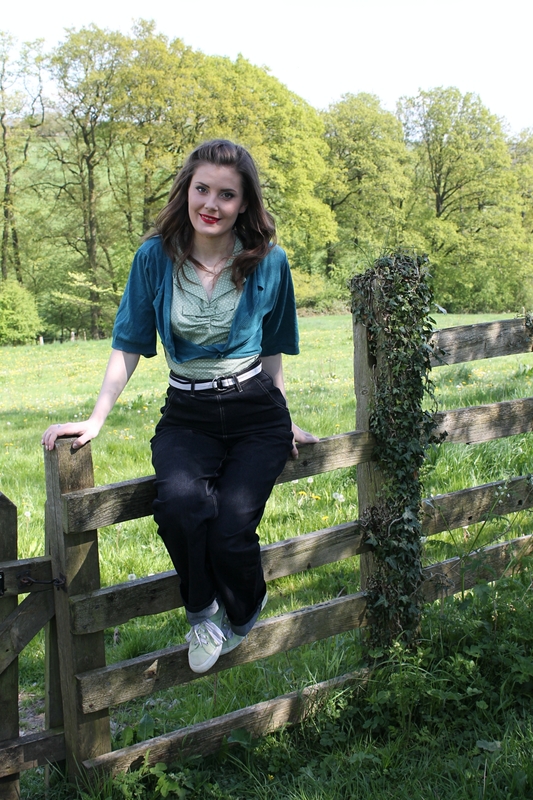 I had a look at a few different retro/reproduction brands and eventually settled on the Siobhan plain jeans in black from Collectif. Since buying these jeans, I’ve been wearing them a whole lot and I definitely like them as much as I like my Freddies. But let’s see how they compare. 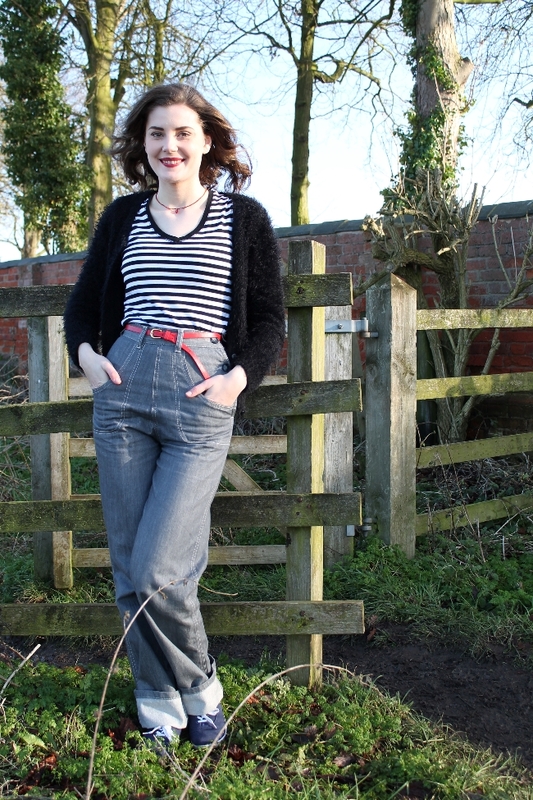 Both of my pairs of Freddies of Pinewood and the Siobhan jeans from Collectif are a similar style with a straight cut leg, high waist, and option for a turn-up at the bottom. I find the style flattering and comfortable (due to the high waist and wider legs), and an authentic vintage style which I like to wear with boots, keds or high tops for a more casual look or paired with a wedge or low heel for a slightly dressier option. Freddies of Pinewood size their jeans according to measurements and provide a video showing how to measure yourself (waist, hips, etc) for the best fit. I’m in between sizes as far as Freddies go so both times I opted to size down rather than up as I personally wanted the option of being able to wear the jeans without a belt as well as with one. For this reason both pairs are snug on the waist, but not tight enough to be uncomfortable, and I like the fit of the rest of the jeans in terms of the rise and fit around the back. Collectif meanwhile size their items in a modern fashion – in other words you can buy a size 8,10,12, etc. According to their size chart I am best suited to a size 8, which is my usual size in modern clothing. I find that there is plenty of room in the waist and they fit somewhat better with a belt. The rest of the fit is comparable with the Freddies of Pinewood jeans – no bagging in weird places, just all the benefits of this style which I think are so much more flattering than a lot of modern styles of jeans. My grey Freddies and the Collectif jeans both have enough length in the leg for a nice turn up while the blue pair of Freddies are much shorter in the leg. You can see from the pictures that I have worn them with a turn up, but I now wear them with the legs turned down which I think looks a lot better, although I do occasionally roll them up to mid-calf length to wear as capris which also works. 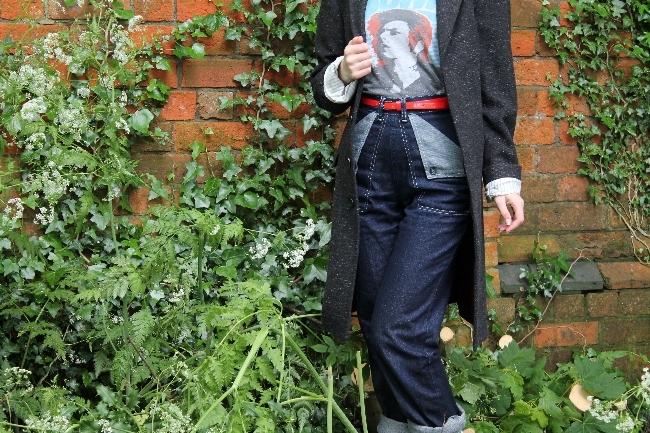 Full price, a pair of Freddies will set you back in the region of £70 while the Siobhan jeans from Collectif are £40. I’ll refrain from commenting too much on quality for now as I don’t feel I’ve owned the Collectif jeans for long enough to make a fair comparison. While I’ve had on pair of Freddies go into holes, I’m not prepared to say for certain that that was a quality issue as it’s possible I snagged them on something without realising. I am disappointed about the zip though. My other pair of Freddies have been fine though, and are showing only a normal amount of wear for the time that I’ve owned them. If you have any other recommendations for retro jeans, please let me know and perhaps I’ll be able to try them out in the future. I know the Lady K Loves ones are also popular so if you’ve tried them let me know how you think they compare. That's really disappointing! Freddie's aren't exactly cheap, I would have thought they'd last much longer than that. I hope the Collectif jeans end up being a bit longer lasting. This was an interesting post for me. I have never owned a pair of jeans (in fact I never wore trousers until nearly 3 years ago, mainly for religious reasons) but every time I see you in your retro jeans I get tempted. I did try on some skinnies once but found them very restrictive and uncomfortable. I do still prefer a modest style of dress and feel uncomfortable in tight trousers. The price of retro jeans has been a drawback for me and the quality issues with the Freddies is worrying unless you were really unlucky with a rogue pair. I would also not want to spend a lot of money on a pair of jeans if I subsequently found them uncomfortable and not wear them that much. I read this post with great interest, as Freddies' offerings have been the only repro denim (and nearly the only repro pants in general, save for Heyday's swing trousers) that have ever worked for me. I'm a devoted fan and have had all of my pairs for at least 4.5 years now, and am happy to say that they're holding up superbly. I'm sorry that you've run into wear and tear issues with yours already. That's rough for sure! Great job on patching them and trying to get more use from them still.